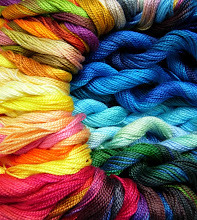 Some of Laura W's hand-dyed threads!! I've been catching up with the inimitable Annie Smith and her podcasts. Yes -- Annie's back, and her 'casts are as much fun as ever. I'm loving this, because it's the perfect accompaniment to the handwork I've been doing for C&G. Today I listened to the 'cast for April 23, and was introduced to Laura Wasilowski of Artfabrik. She has a delightful book out -- Fanciful Stitches, Colorful Quilts. Chock-a-block full of inspiring projects though it is, what I want it for is her technique -- so very similar to mine in several ways, combining quilting, fused applique and handwork. Plus, Laura works small and has some great ideas for displaying small works. And she dyes her own fabric and threads (#8 and #12 perle cotton) -- just as I've been doing of late through C&G. Be still, my heart! So...check out the interview with Annie, and for a visual, quick interview with Laura, check out this more recent clip from Paducah with Frieda. Enjoy! Thanks for the suggestion, Margaret. I have one of Laura's DVDs and have found some of ideas helpful. Will have to check out Annie's podcasts. Ah those hand dyed threads make me weep with longing, I would like to just pop them in a basket beside me and stroke them frequently whilst dreaming up lovely things to embroider. Will be sure to check out Annie's podcasts!